Many people view Easter as a time of renewal, rejuvenation, and hope. After all, it reminds us that no matter how long or cold the winter has been, we can always feel hope for the coming spring. Not many people had a longer or colder winter than Davina and Shawn, two Edmontonians who say that Bissell Centre helped them get their lives turned around. Both have struggled with poverty, homelessness, and addiction for much of their adult lives. Shawn and Davina were married in the summer of 2016, six years after meeting each other for the first time at an AA meeting. Their earliest days together were difficult, as both were living on a low income while trying to overcome their issues with addiction. After they’d been living together for a while, they were overjoyed to discover that Davina was pregnant–but their joy would be short-lived. “We ended up losing the baby,” says Shawn. “That was really hard.” Shawn and Davina suffered a relapse shortly afterward that lasted months. Davina knew that they needed to change their lifestyle if they wanted to make a home for Noah, her two-year-old son from a previous relationship. “We cleaned up,” she says. “We weren’t sure if we were going to make it.” Davina decided to enter a one-year treatment program for her addiction. Of course, things are still far from perfect for Davina and Shawn and their growing family. Although Shawn is thankful to have a steady source of income, his camp job takes him out of town for weeks at a time, leaving Davina alone much of the time to take care of their children. It will get easier, says Davina, once the kids are old enough to go to school. But for now, Davina and Shawn will have to do what they’ve always done: carry on together. 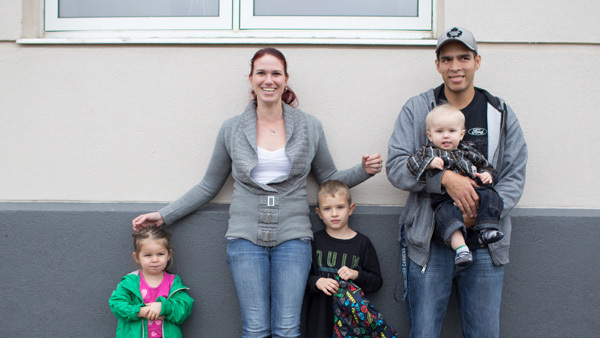 Your support enables young families to persevere by accessing the support they need most. Please donate to help more people like Davina and Shawn.